During six days three Czech volunteers worked on the Ark Animation Farm, created by the joint efforts of Caritas – Kolomyia-Chernivtsi Eparchy and the partner organization Archeparchial Caritas of the city of Olomouts (Czech Republic). The goal of the animation farm is the rehabilitation of children who are psychologically and physically challenged, the rebirth of old shepherd traditions and ensuring an environment for a family vacation. For Tomash, Yana, Yirzha and Waclaw this is not a first visit to Ukraine. They assisted in the flood clean-up in Transcarpathia in 2008 and they also worked in Lopatyn (Lviv region) and other towns where they realized small projects. However, it was the first time that the Czech volunteers were in Kolomyia. They admitted that they have not yet had a chance to see the city because they start working on the farm in the early morning, and by the time it’s evening, they just want to rest. In the meantime the Ark Animation Farm has already managed to become a favorite place for many local children as well as those from the city. On holidays quite a few families come here in order to give their children the possibility of spending time with animals. The main objective of this farm is assistance in the development and support for children with special needs through their contact with animals. 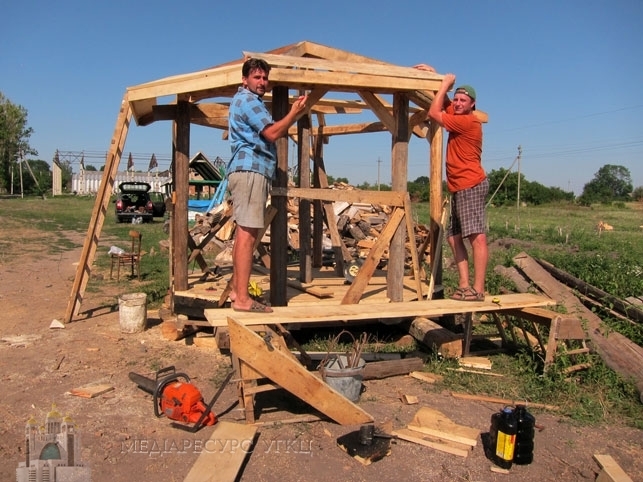 Each of the Czech volunteers has a host of obligations in the Czech Republic, a job and a family, but they have sacrificed everything and have paid their own way to come to Kolomyia and do a good deed – to build with their own hands a summer house and thus to decorate the lake on the farm of the local Caritas. Go to the beach or to Ukraine? This is not a choice that the Czechs considered. They say in unison that when you sacrifice your time, money and efforts for a good common cause – you receive in return a satisfaction ten times greater than the effort. The volunteer movement in Ukraine in general, and in Kolomyia in particular, is very weak. For its development such examples to be followed are crucially needed. Therefore, Caritas-Kolomyia-Chernivtsi Eparchy is very thankful to the volunteers from the Czech Republic for the gift of the summer house and even more, for their good open hearts!